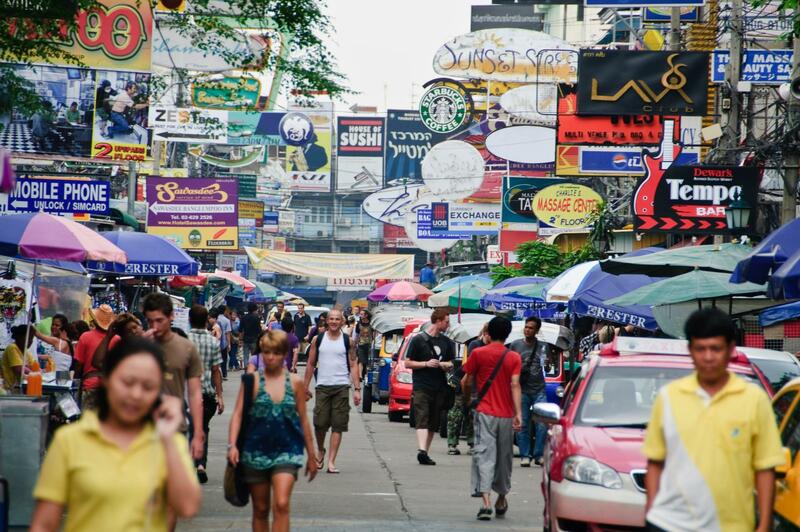 72 hours, sadly, is not enough for any tourist to explore Bangkok completely. However, if you plan to see just the very best sites of the city, 72 hours will do. In fact, it will be 3 days full of wonders, beauty and amazement. How do we know that? Because here is our itinerary that contains the most legendary historical spots, most gigantic entertaining areas, top food heavens in Bangkok and endless amazing things to do in Bangkok. Hopefully, you won’t be too excited after reading it through. 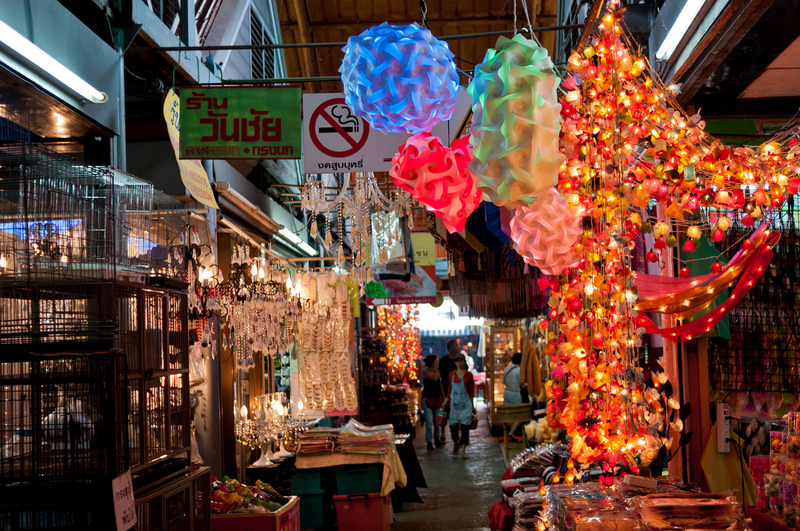 Here are our recommendations for where to go in Bangkok for 3 days. Bangkok is a famous tourist city, everybody knows that. But unlike Shanghai, or Singapore, or Tokyo, this city is not famous for looking sleek and shiny. In fact, it is quite disorganized, noisy, dusty and smelly here and there. And yet, tourists are still madly in love with it. It’s its people that make this city so peculiar. With the strong influence of Buddhism, Thai people are peaceful, sincere and simple. The most genuine and authentic Thai culture and lifestyle are maintained nowhere else but in the residents. 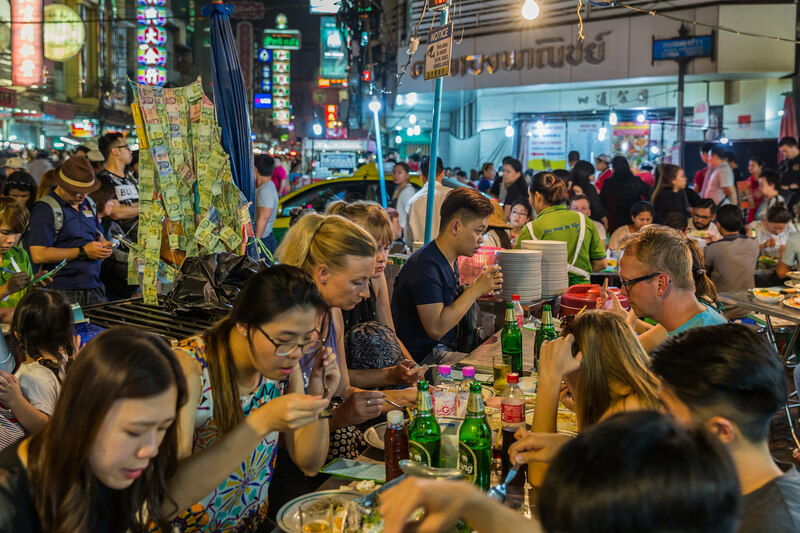 In Bangkok, if you want to eat the best Pad Thai, you will find it in some roadside, roofless stalls where the locals sit on tiny plastic chairs to eat. To experience local things in Bangkok to the fullest, you should rent a scooter, or just hop on a crowded Songthaews that probably does not look like the safest transportation (Don’t worry, we’ll get to that in a bit). The motto you should carry throughout this trip is ‘Just join the locals’. 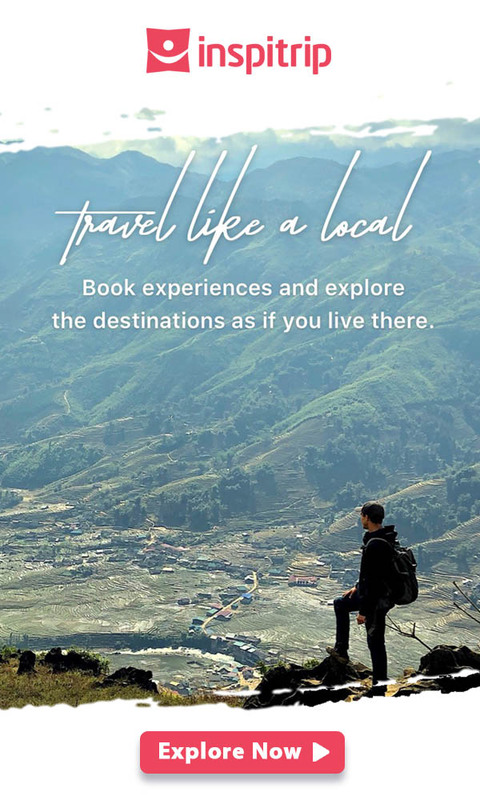 I made this itinerary base on the one and only vision: take the readers to where the locals are. Therefore, this blog won’t give you recommendations on top-notch restaurants, or costly rooftop bars. I hope this helps you understand better what you are going to read. Now let’s get on with it, shall we? Oh, it is wise to travel to Bangkok in the weekend, so many special and appealing places and activities in Bangkok only open on Saturday and Sunday. Bangkok is obviously famous for its temples. There are over 400 temples in which 3 are absolute wonders. 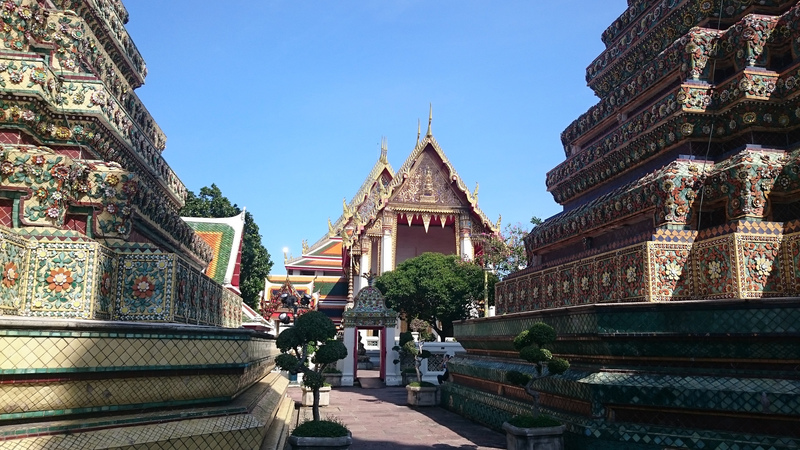 The Grand Palace (Wat Phra Kaew), Wat Pho and Wat Arun. There are certainly the most attractive tourist sites of the city. The 3 places are located close to each other, therefore, you can easily explore them all in about 3- 4 hours. Also, in most cases, the temple tour starts at the Grand Palace to Wat Pho, which is right next to the palace and ends at Wat Arun, which is right across the river. Find the nearest station to catch the BTS to Saphan Taksin station. Depends on where you come from, it is possible that you have to change the train at Siam station so don’t forget to ask or check the map at the station beforehand. Underneath Saphan Taksin station is Saphan pier, or Central pier, where you can take a boat to travel on the famous Chao Phraya river. You should be able to find a blue arrow, which is the sign for tourist queue. The local boats (Chao Phraya Express Boat) always come from your left. Pick those with no flag, orange flags or green flags, and head to “Tha Chang” or “ pier N9”. Journey fare for this should be somewhere between 12-15 baht. At Tha Chang pier, if you travel with a local, it is no issue to find your way to the Grand Palace. If you are all alone, just follow any tourist groups being led by a tour guide. One tip to recognize any tour guide: they normally hold up high a bright colour flag while walking. You can catch a Chao Phraya Express Boat at Tha Phra Athit (pier N13) and get off at “Tha Change” or “pier N9”. From here, it is the same way to go to the Grand Palace as mentioned above. A taxi should make the best travel option. You can also rent long skirts and long pants but it is not very comfortable so it is best to avoid it. The entrance fee is 500 baht. Free guided tours in English are available at 10:00, 10:30, 1:30 and 2:00. You can also rent an audio guide for 100 Baht with the condition of providing your passport and credit card to secure return. 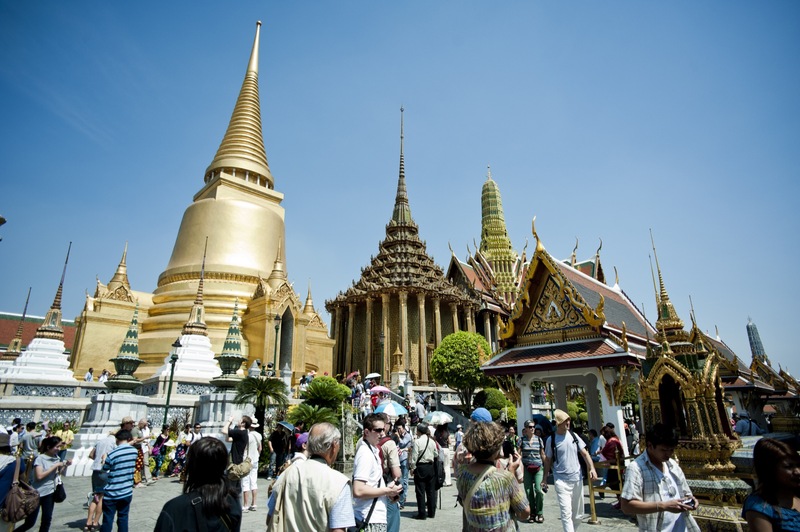 The two main attractions here are the Temple of the Emerald Buddha and the Central Court of the Grand Palace. However, the admission fee also includes a ticket to visit Vimanmek Mansion- the world’s largest teakwood building that was built by the Royals at the beginning of the 20th century. 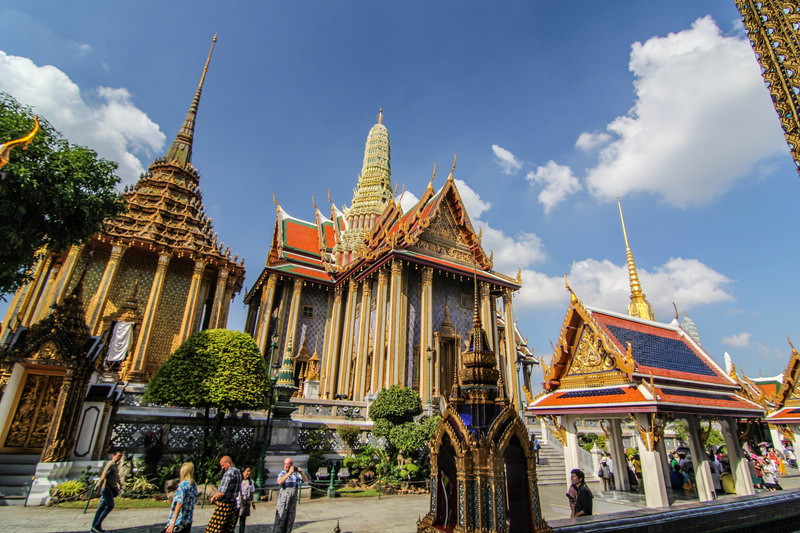 Unlock the regal secrets of Bangkok’s Grand Palace and sacred temples with Inspitrip now! 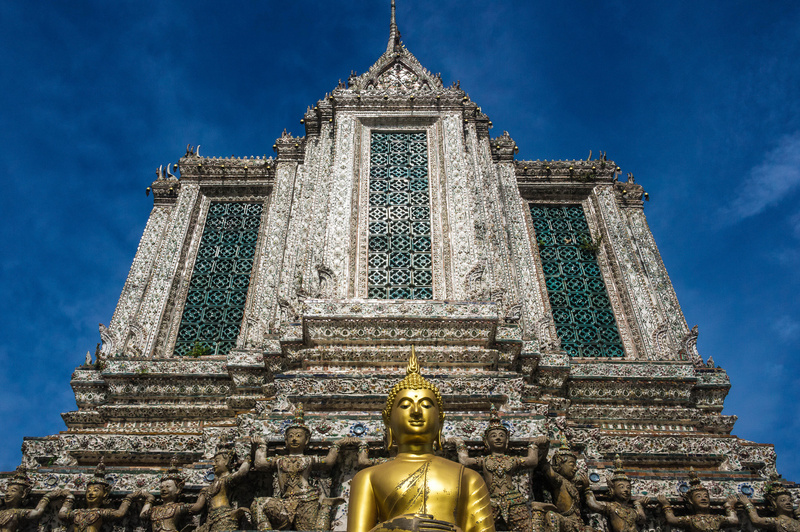 Wat Pho, also known as the Temple of the Reclining Buddha, is located right behind the Grand Palace. Once you get out of the Palace, go around the block and you will find the entrance of this temple. It is about 10 minutes walking from one to the other. Entrance fee is 100 baht. 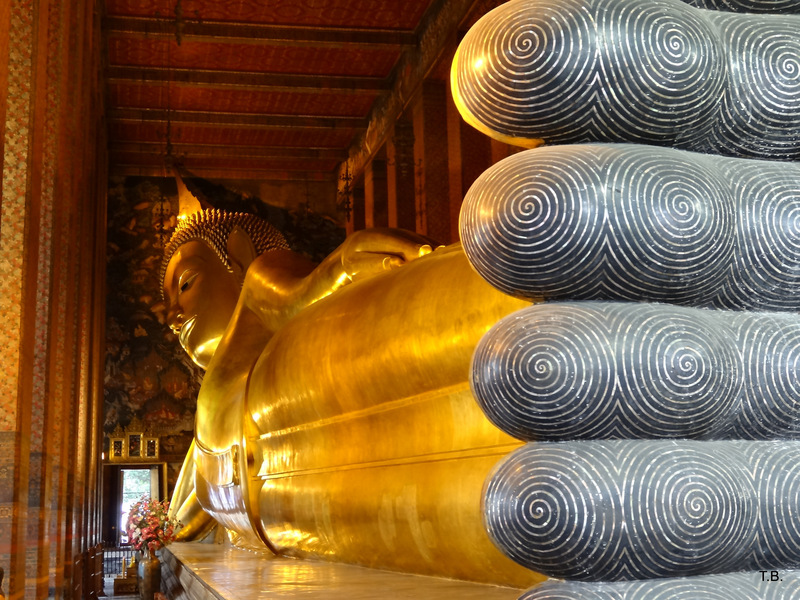 This temple is famous for housing the giant reclining Buddha that is 46 meters long and covered by gold leaf. Wat Pho is the temple is the first and oldest traditional school of Thai massage technique. The price should be around 260 baht for 30 minutes and 420 baht for 1 hour. The service is available until 5PM. It is worth every penny because nothing beats a comfortable and relaxing foot and head massage, especially when you are in really good hands. The temple is much less crowded, comparing to the Grand Palace, and still, significantly gorgeous. It is an ideal spot to take lots of photos without being interrupted. Once you finish your tour here, it should be around 12- 1PM. There are plenty of street food stalls outside of the temple, where you can easily grab yourself a good lunch or snack. Here, you can also find a lot of souvenir stores, if you are interested in getting some traditional gifts for your family and friends. 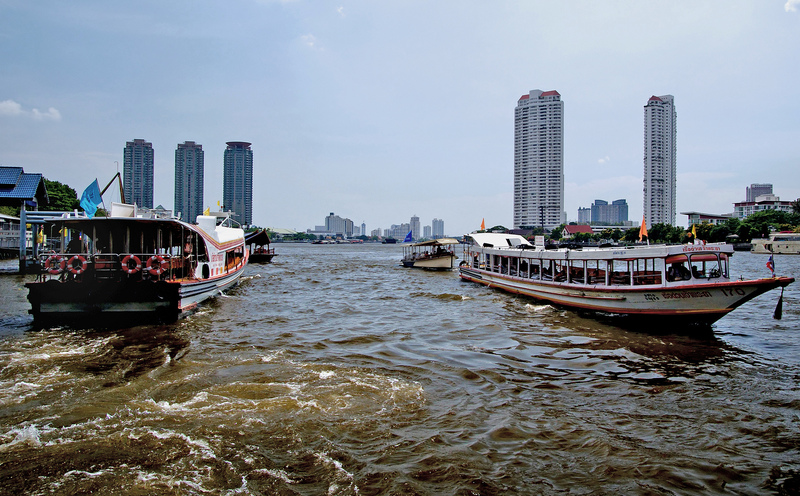 From Wat Pho, you can visit Wat Arun by taking a quick ferry at Tha Tien pier to cross the river. It should be around 3- 5 baht for one turn. The entrance fee is also 100 baht. Wat Arun is a ‘prang’, which originates from Khmer architecture, and has a conical shape with a broad base getting narrower towards the top and one entrance on one side. The temple is 80 meters tall and you can actually climb up to the top. If you are scared of heights, it is better not to try as the steps are quite steep and climbing down can be quite terrified. 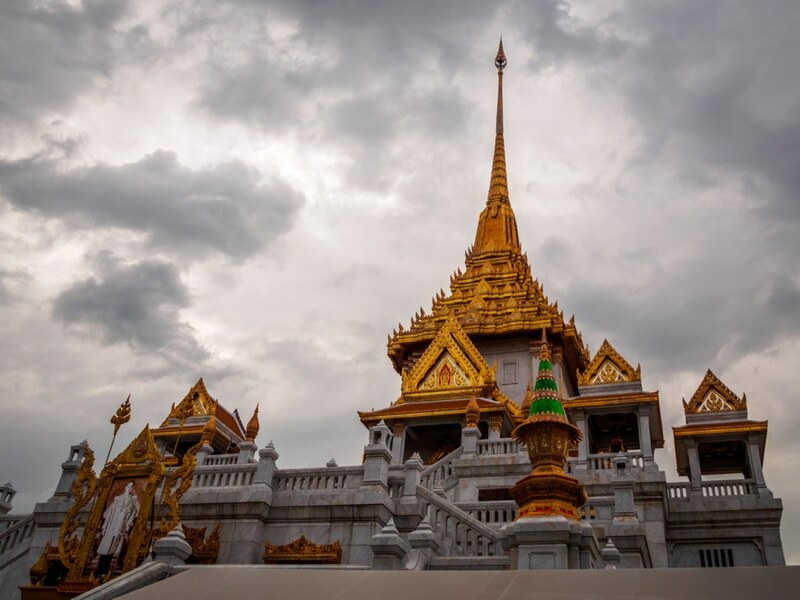 If this is not an issue, it is highly recommended to get to the top of the temple, where you can witness yourself an spectacular and breathtaking view of Bangkok. When you finish visiting Wat Arun, it should be around 4PM. From here you can walk around the area to explore more of residence life. There are also plenty of Thai restaurants. However, it is better to take a ferry to go back to Wat Pho and the Grand Palace. 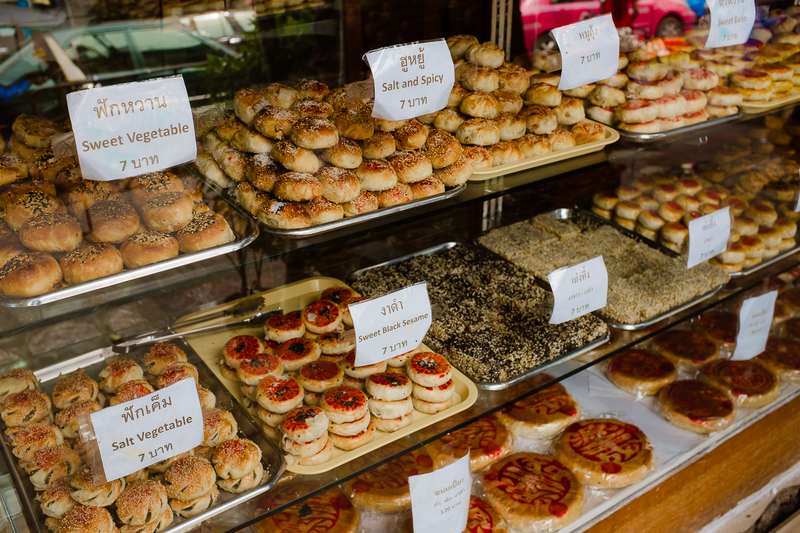 Since this area is the main tourist attraction of Bangkok, there will be more food options. You can either pick a random local restaurant or find riverside ones, which can be a bit more expensive and mainly for tourist. Needless to say, these restaurants can be a bit more expensive, but in exchange, you don’t have to worry about the language barrier and the view will definitely worth it. Honestly, the language barrier is not a massive issue in this spot of Bangkok or any tourist areas of the city. You can easily express what you want in English… and a bit of body language. 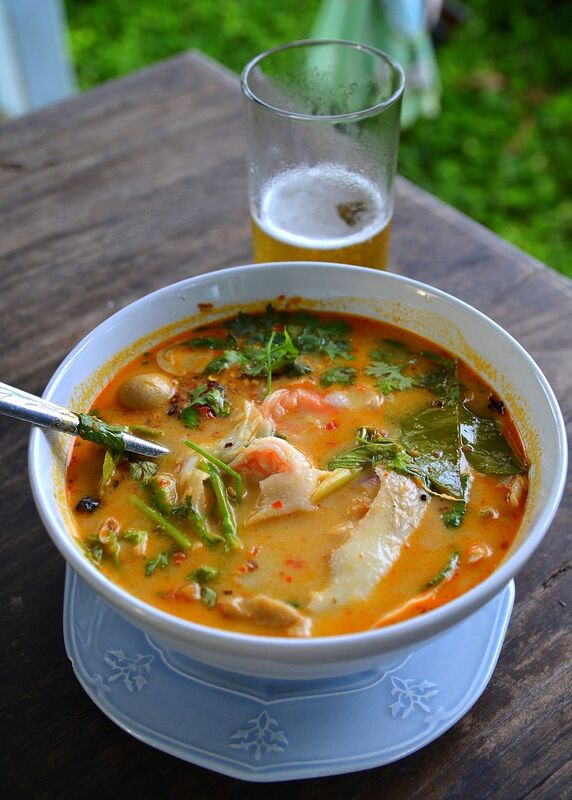 Keep in mind, Thai cuisine is famous for it spiciness. If you are not a big fan, don’t hesitate to ask dishes with no chili or less spicy. Your trip to the Grand Palace area should be accomplished by 7PM (with a happy tummy of course). 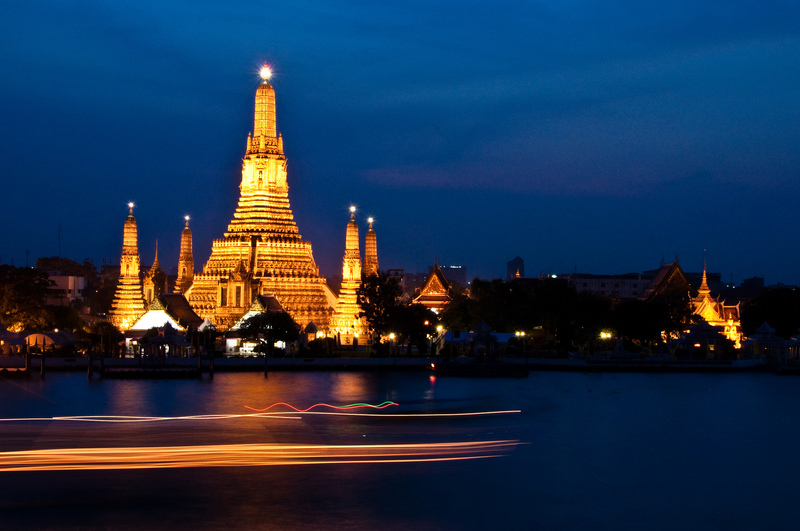 Time to head back to your hotel and prepare for Bangkok nightlife. 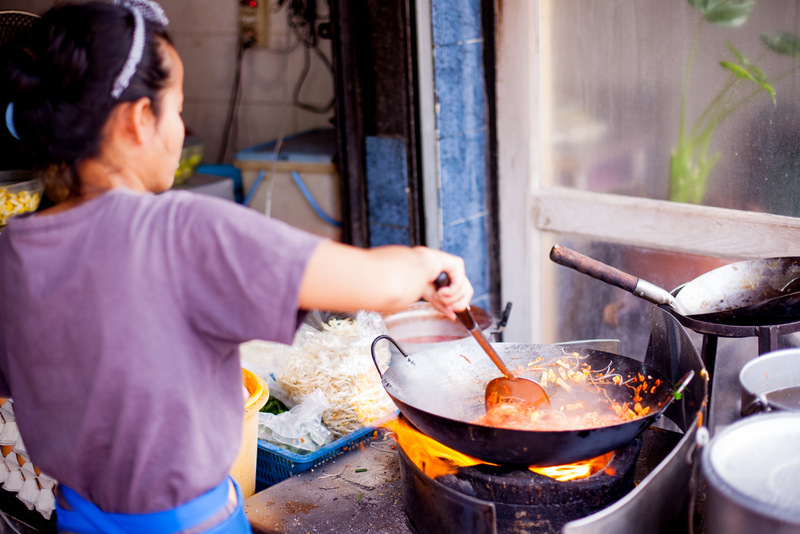 How does exploring Thai culinary refinement by a tuk tuk sound? 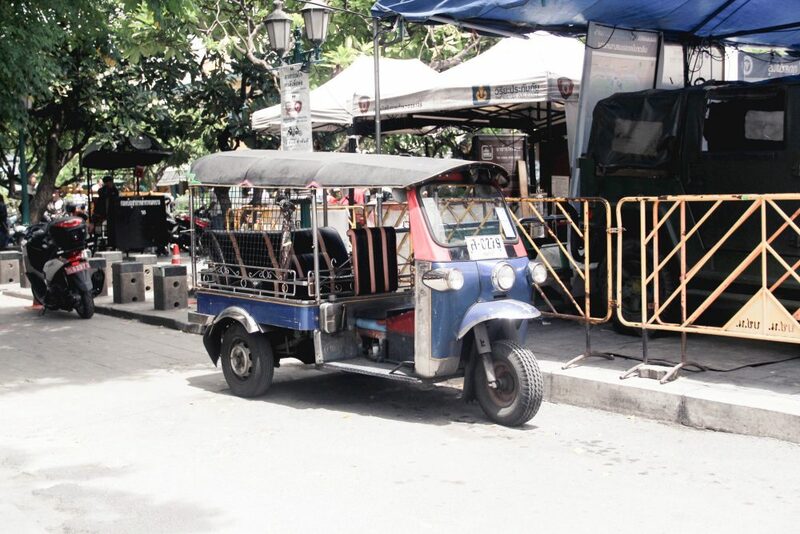 Join our food tour by tuk tuk now to fill your tummy with tasty Thai food! The backpacker capital of the world. The hub of entertainment and street food of Bangkok. 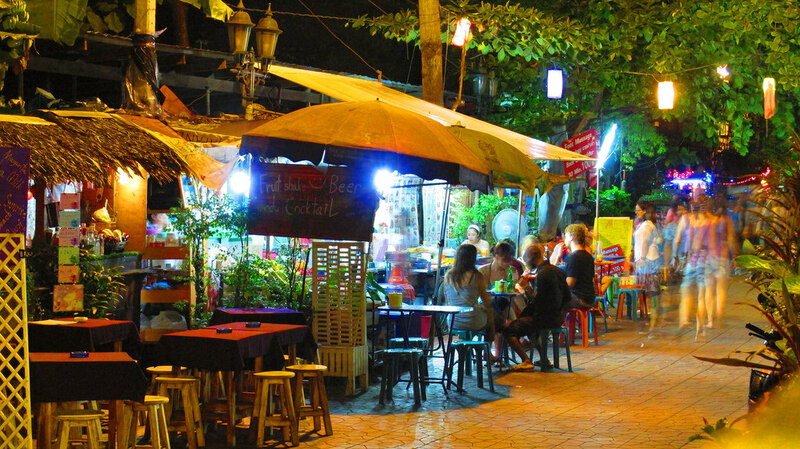 Khao San Road has an immortal place in tourists’ must-visit lists. Here you will find countless of food stalls, beer bars, pubs, restaurants, budget-friendly hotels and travelers from every corner of the world. It should be free tour here. Try whatever you are in the mood for, eat and drink wherever you feel like and explore any street you want to. Never take a Tuk Tuk here to anywhere, they tend to rip you off. If you need to get a cab, find your way to the main road. The street opens until 2AM only. If you plan to stay up all night, it is better to plan for another destination afterward. BUT, there is another place, very close to Khao San Road, where you don’t have to sweat in congested traffic and suffer in the crowd of shoulders to shoulders pedestrians. It is Soi Rambuttri. This street is one of the cool places in Bangkok that is not heavily promoted, yet. Thus, it has fewer tourists and more locals. Street food here is better than in Khao San Road and it opens all night. To arrive at Soi Rambuttri, you can go from Khao San Road to Thanon Chakrabongse. Ask any locals and they will show you. This area is quite peaceful, to compare with Khao San Road, yet, hectic enough to entertain any visitor. You can end your day here, head back to your room and rest. However, if you want to know what partying in Bangkok will be like, take a taxi to RCA- Royal City Area, or Sukhumvit Road. Soi Cowboy is also a place to see as it is one of the three red light districts in Bangkok, but a bit lays back to compare with the other two. Here is where The Hangover 2 was filmed. Parties never end in these areas of Bangkok so you will for sure have the night of your life here. 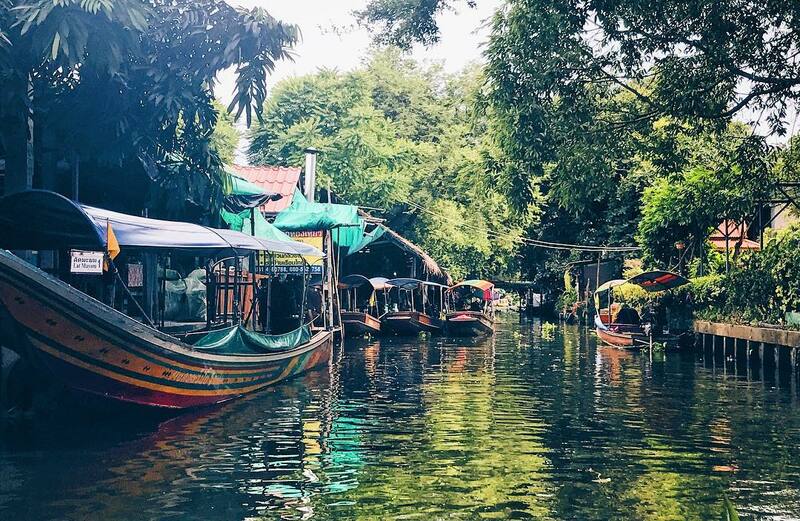 A bit outside of Bangkok, this is one of the 3 floating markets and also the most traditional and largest one in Bangkok. The purpose of adding this destination in the list is to give you a relaxing getaway from the hustle and bustle of Bangkok center. 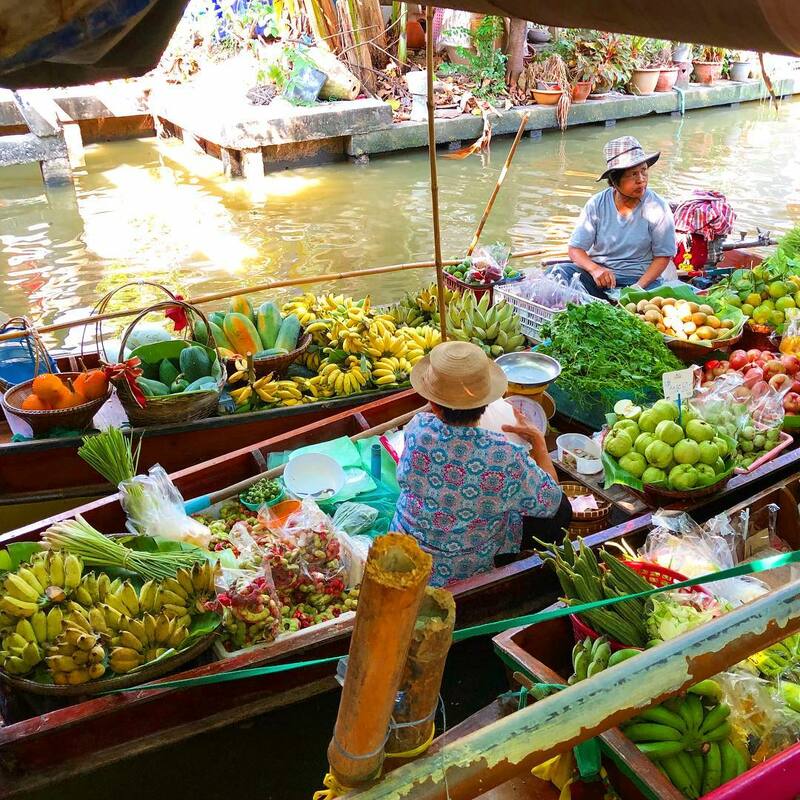 The floating market is not a heavy tourist site and you may find yourself as one of a very few foreigners in the whole area. To reach the market, you can take the BTS on Silom Line and go to the very last station (Wongwian Yai), where plenty of taxi drivers are waiting to take you to the spot. The idea of a “floating market” is somewhat not correct anymore. The canal is quite narrow, therefore, only a few boats are allowed to park alongside the riverbank and most of the sell fruits, fresh vegetable and fish. There are plenty of low tables and tiny stools where customers can sit and enjoy the fruits after buying them straight from the boats. The bigger part of the market is the open market on the ground. There are 2 areas, one is for fresh market and the other one is dedicated to all kinds of food, from snacks to cooked food. The one thing you must not leave without trying at the market is fruits. If you are from a Western country, try banana or mango, this place will change your definition of tasty fruits. 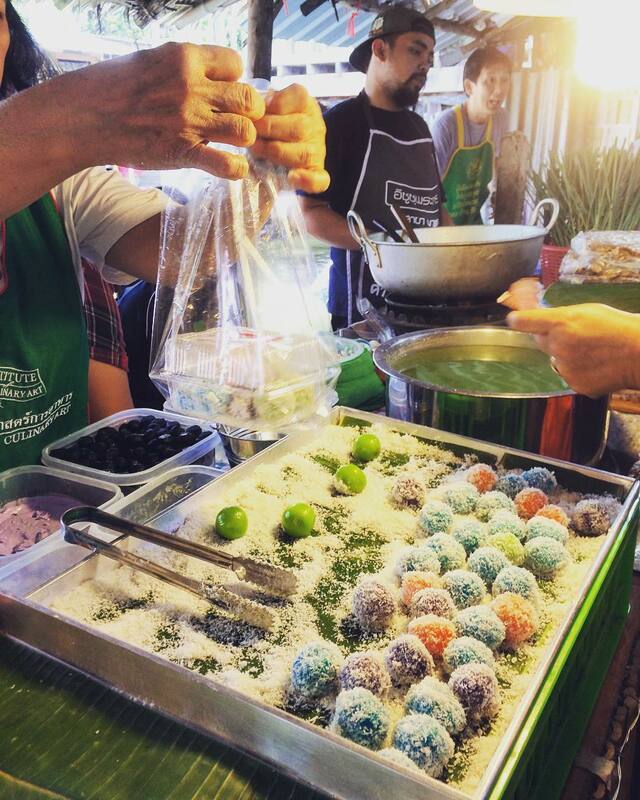 Tropical fruits of Thailand will seduce you so hard, you forever crave for them. Unfortunately, if you are not in Bangkok during the weekend, you can visit Siam Center instead. It is a gigantic shopping area in Bangkok where you can find all the brand names in the world, expensive Thai traditional clothing, best international restaurants and food chains. Madame Tussauds Wax Museum and SEA LIFE Bangkok Ocean World are the two interesting destinations in the area. After spending the morning outdoor, you can head back to the city, either to your hotel for a rest or to Chinatown. Bangkok Chinatown is one of the largest Chinatown in the world. 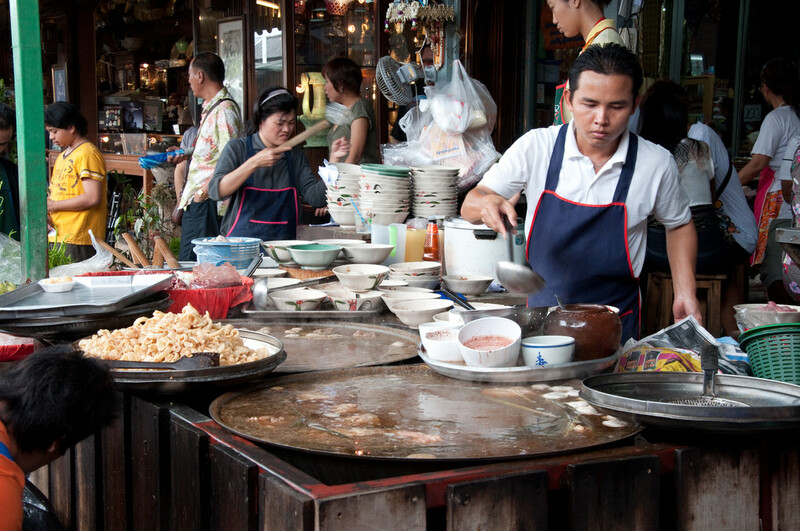 The area offers tourists with plenty of temples, open markets and especially, food. Here is THE FOOD HEAVEN. If you are a big fan of Asian cuisine, Chinatown is where you can best experience of your life. With recipes that pass from generations to generations, dishes that you cannot even find in top-notch restaurants, Chinatown is adored by any food lover, foreigners and locals alike. If you are in Chinatown, you should visit Wat Traimit. 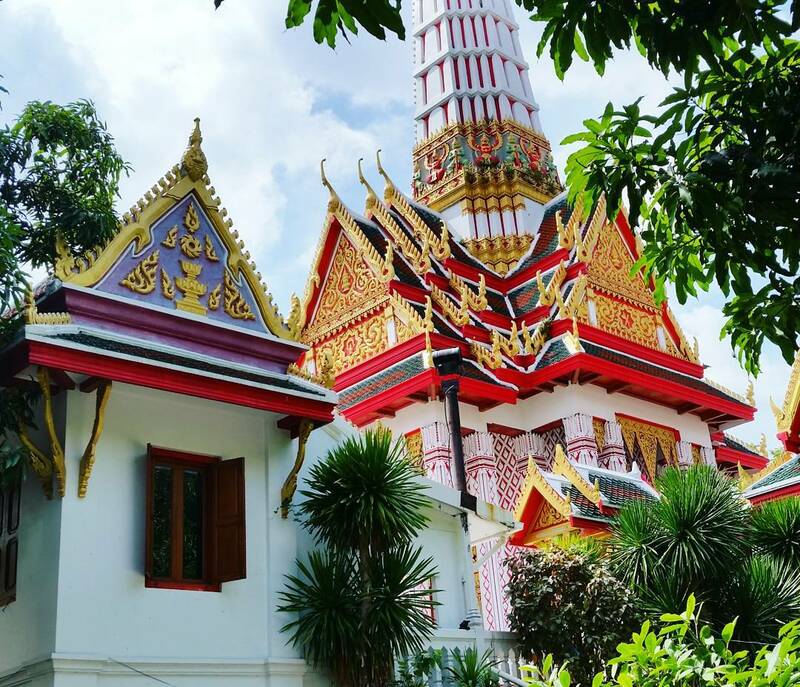 Every temple in Bangkok has a different atmosphere, beauty, and religious purpose. This temple is famous for housing a golden statue of Buddha that is more than three meters high, weighs 5.5 tons, and is likely some 800 years old. Wat Chakrawat is another temple in Chinatown that worth a tour. The temple is special for its special residents: 4 giant crocodiles. 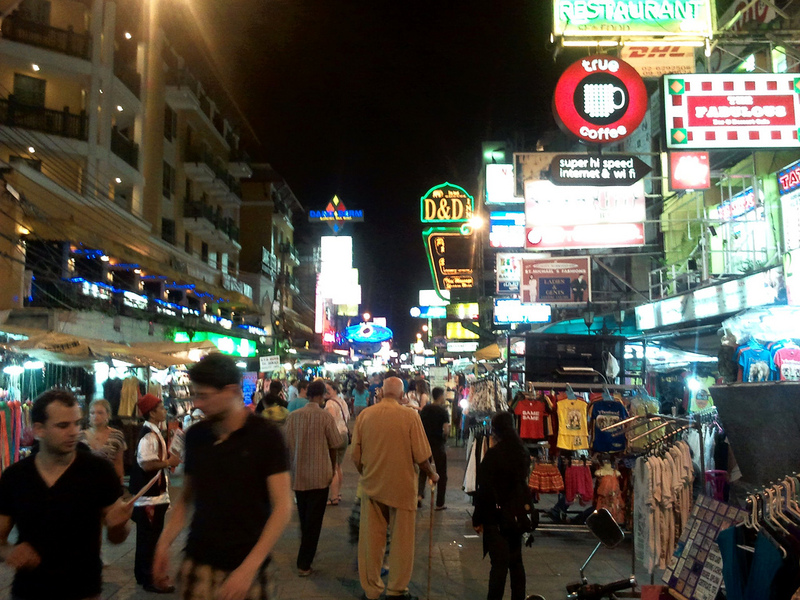 If your days in Bangkok does not include weekend, Patpong Night Market in Bangkok would be a great alternative. It opens everyday, from 6PM- 1AM. The market sells all kind of products and backpacker necessities. Lying very close to Go-Go bars area, this place is always full of foreign tourists as well. 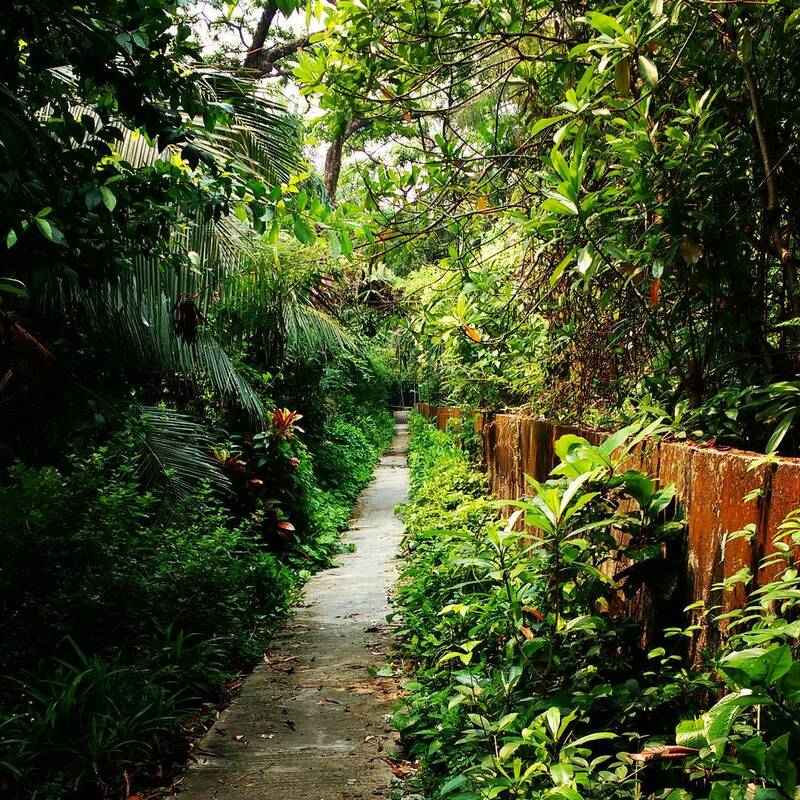 Who would think right in the center of Bangkok, there is a hidden gorgeous green oasis? Bang Krachao is the green lung of Bangkok. 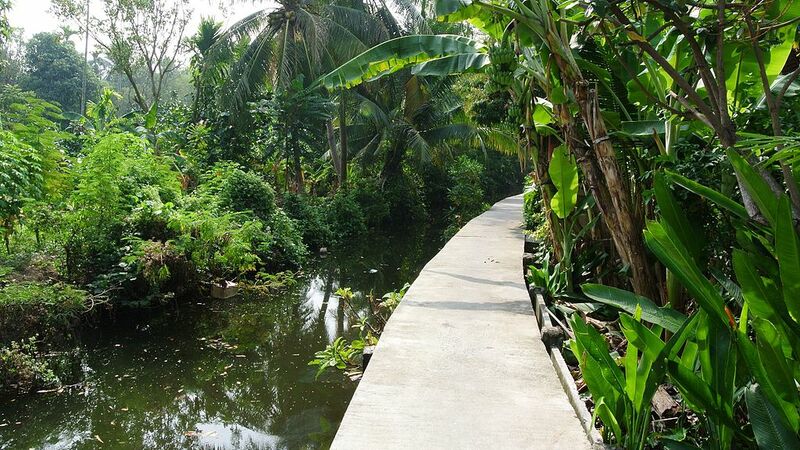 And by saying green, this small island, which is preserved by the government, is literally covered by trees and bamboos. By MRT or metro, you can make your way to Klong Toei station. From there, you can get a cab to Klong Toey Pier, where you can catch a ferry for 5-10 baht to cross the Chao Phraya river and arrive at Bang Krachao. Of course, you can catch a taxi to go directly to the pier. The main mean of transportations on the island is bicycles, which you can rent for around 60 baht a day right at the entrance. Joining a biking tour around the island. Going on a firefly tour on local boat (for 30 baht). Visiting Bang Nam Phuen floating market. Paul Mueller is an American engineer- cyclist, who moved to Bang Krachao in 2012 to open traveling tour. 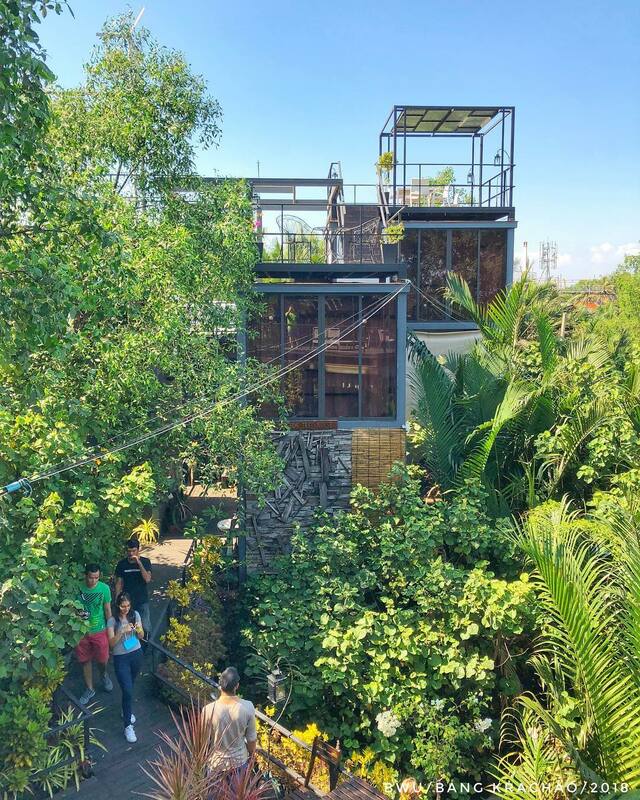 He built a beautiful tree house with a full eco-friendly system, where you are always welcomed to visit. If you are not confident about traveling to and around Bang Krachao yourself, you can contact him through his email- mad_muiller@yahoo.com. A trip to Bang Krachao can easily take up your whole morning and afternoon. The rest of the day should be up to you to decide. After days of intense sightseeing, you should unwind yourself, walk around some nice area, do some exploring on your own, buy some souvenirs or just simply sit somewhere and enjoy a drink. Tuk-tuk drivers tend to rip you off. If possible, travel by metered taxis or rent a scooter. Feel free to bargain if you feel the price is too much. Thai people do not feel offended by this. If you have weak digest system, choose restaurants over roadside food stalls. Bangkok is very hot and humid in the summer so wear light, bring water and mind your outfit if you plan to visit big temples. Songthaews is a type of open bus in Thailand. It offers travelers short distance transport and is only available in outskirts areas and in the private estates to take people to the main roads. 12-15 people can fit in a songthaews and it can be a bit dangerous the number of passengers exceeds the limit. Still, it is a very common and fun way to move around in the city. There you have it, an ideal itinerary for 3 days in Bangkok. Keep in mind, there is no such the perfect plan for travel. It is all about trying, daring and exploring yourself as well as the surroundings. As I said at the very beginning, you can visit a lot of places, but at the end of the day, the most original Thai culture is right in its people. So bring an open mind and respect along the way as the most important accompanies. You know the motto! Just join the locals.